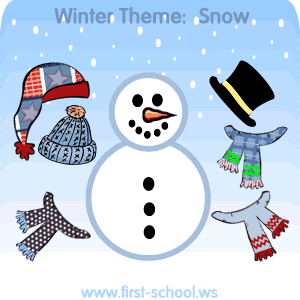 Enjoy snow, snowflakes and snowman theme educational activities for preschool and kindergarten. You will find free crafts projects, printable activities and coloring pages with easy to follow lesson plans. These activities are adaptable for various themes and holidays listed within the lesson plan. Climate | Weather What is snow? What are snowflakes? Snow theme coloring pages: snow, snowflakes, snowing, etc. Holidays & Events These activities can be incorporated within winter holidays activities.